When you think of an Audi vehicle, you instantly think of luxury, quality and prestige. This well-earned recognition for providing magnificence in each and every one of their models, is reflected in RAC Cars range of used Audis. The used Audis for sale in our collection are a popular choice for those looking to enjoy an upscale vehicle, at an affordable price. With worldwide quality that Audi’s rivals could only dream of, it is no surprise that they’re one of the biggest brands in the motoring industry. 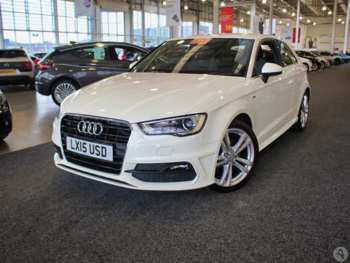 Did you know that the Audi A1 is one of the most premium small cars you can buy? It is economic and has a heavy focus on driving style, meaning that you can save money not only when you buy a used Audi from us, but for long after too. The Audi A2 is also a popular choice for a used Audi because it has very low running costs and a beautiful interior. The mainstream A3, A4, A5 and A6 models sell well with diesel engines, but the latest generation petrol models shouldn’t be overlooked, especially if you can find clean, low mileage demonstrators. With Audi launching models at a dizzying rate, the future looks good for used car buyers looking at the Audi Q3, Audi A7 and the Audi A8. Plus, since Audi models don’t date rapidly, they are a safe home for your money. Audi is a German-based car manufacturer that focuses on attention to detail and affordable extravagance. They have countless awards under their belt such as “Best Family Car”, “Best Compact Executive Car of the Year", alongside “Best Luxury SUV” and “Best Coupe of Year”. Still not convinced? Every Audi model promises efficiency, safety and technical excellence and what more could you want? Browse our range of used Audis to find your next car.